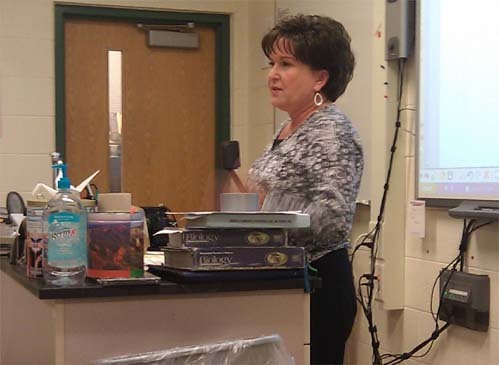 Onekama High School physics teacher Laurie Blevins was determined to make the most of every contact moment with her students. With an already-packed curriculum, Blevins found a creative way to bring additional learning experiences to her students: LUNCH. 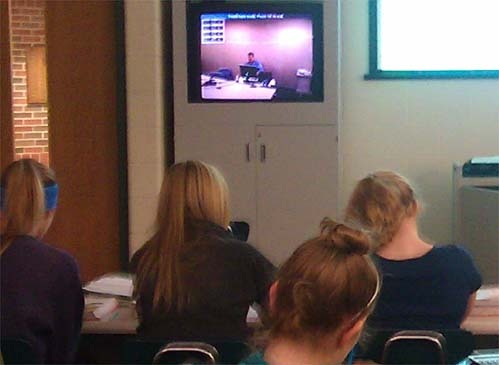 OHS students speak remotely with aerospace engineer Howard Bowersox via teleconference from the school’s distance learning room. “I knew that I wanted to start something this year to link students with the science community to try to spark some interest in the scientific fields. I thought since my class was right before lunch, I may be able to convince students to eat lunch in my room if I could get science professionals from our surrounding communities to come in and talk with them,” explained Blevins. 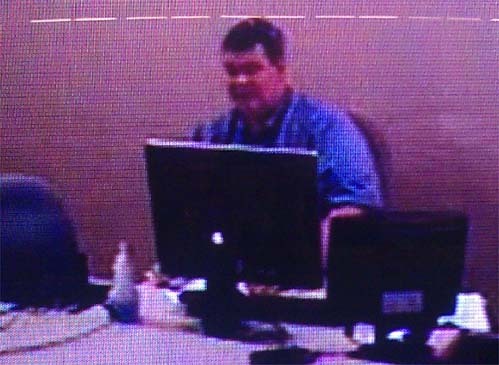 Blevins contacted Manistee-native Howard Bowersox, who has a degree in Aerospace Engineering from the University of Michigan and now works at Boeing in Seattle, WA. She asked him to participate in a live video conference with her high school students. Bowersox was immediately on board. With the help Onekama School Technology Coordinator Bruce Peabody, on Friday November 4, 2011, OHS physics students were able to have lunch, conversation, and inspiration from a real-life “rocket scientist.” Bowersox was streamed through the large screen in the ITV room, and his computer was connected to the Onekama School projector system so that the students were able to view Bowersox’s PowerPoint presentation, complete with airplane and rocket videos. 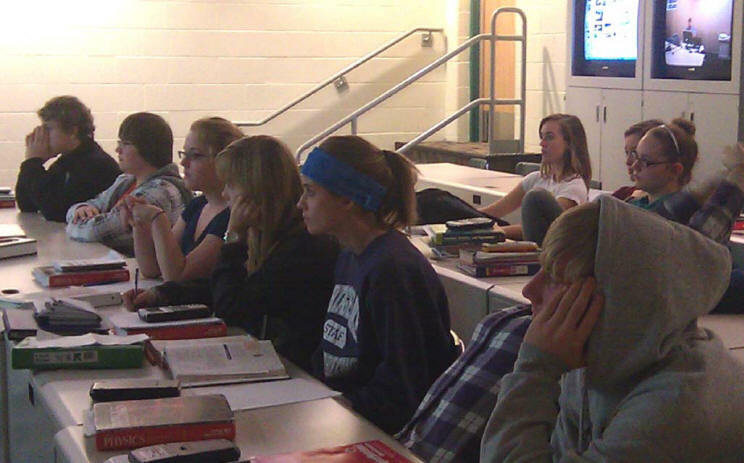 The lunchtime conference made an enormous impression on the OHS students. Sophomore Claire Harvey commented, "It was really interesting to hear about all the history he knew and all the structural obstacles that exist in aerospace engineering. There were so many things to think about after the presentation." "It was so fascinating! Just knowing that what we're learning about can actually be applied in these jobs. I was blown away by how cool Mr. Bowersox made everything seem," said Junior Elizabeth Bergren. Added Senior Cordell Williams, "The presentation literally left me speechless, and not a lot of things do that, so you know it was legit!" More than a discussion of rockets and engineering, Bowersox motivated students to consider potential careers in science. As Bowersox explained, engineering is an exciting field right now because it has gone beyond what students learn about in the physics classroom and has become somewhat of an art form, combining math and art in order to bring new and innovative designs to the world. “It’s important for working professionals in the sciences to reach out to students because it provides a reality check and a connection to what they are learning in school,” said Bowersox. “It's a way to say, this is real, and here is how you can use it.” Bowersox and Blevins both challenged the students to become the next generation of engineers who solve the riddles that still elude us in the field of science today. "It gave me a chance to see what working in the engineering field is like,” said OHS Junior Emily Barnard. “I feel so lucky to have had this opportunity." Bowersox, a native of Manistee, inspired students to explore careers in science. Technology bridges the distance: With the help of video cameras, projectors, and speakers, students in Onekama are taken to the Boeing Corporation in Seattle. 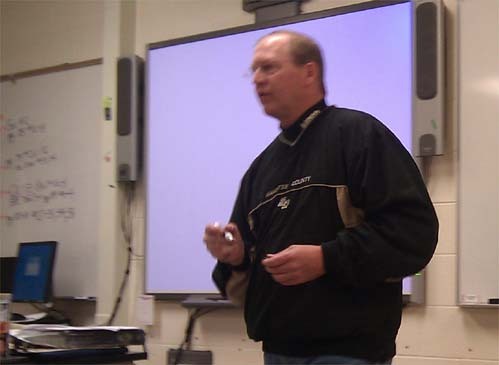 Blake Fitch, a member of the Accident Investigation Unit of the Manistee County Sheriff's Office, shared how he uses physics everyday to figure out what happened in an automobile accident.